Although she was born to two white parents, Rachel Dolezal claims that she is Black, a label she prefers to African-American. The Africana studies professor and now former president of Spokane’s NAACP local chapter has been living as a Black woman for at least a decade, but she was recently “outed” by her parents, who revealed details of Dolezal’s true identity on HuffPost Live. The story of Dolezal’s perplexing experience “adopting” a new race has given some of us a few chuckles, but, more importantly, it has caused many of us to think more deeply about who gets to be black, as well as when and why. A group of experts asked by PBS to distinguish between race and ethnicity agree that race refers to a biological classification of humans based on somewhat common physical attributes and ethnicity refers to shared culture, including language, heritage, religion, and customs. Race, though based on physical characteristics, is a social construct over which we have no control because it is determined by how others perceive you. David Freund ascertains, “racial categories have had a much more concrete impact on people’s lives, because they’ve been used to discriminate and to distribute resources unequally and set up different standards of protection under the law.” John Cheng asserts that unlike ethnicity, which can be adopted, “you either are or are not a member of that race.” But, when discussing a concept as complicated as race, nothing is ever that simple. Color, and who qualifies as Black [and] who qualifies as White has historically been policed, not by those who were the targets of oppression but by those who set-up the system of oppression as a way to dole out the goodies or to withhold the goodies from a society where color has been the dividing line for opportunity. The tenet of self-identification is strongly endorsed by many Black feminists and womanists, and as a Black feminist, I wholeheartedly support Black women’s right to define themselves. But I find it problematic when a woman who allegedly has two White biological parents and was raised in a White home feigns Black womanhood. To be clear: this is not about Black women policing who gets to be Black. (To do so would be the oppressed becoming the oppressor.) This is not about the exclusion some biracial and multiracial women experience when they are accused by some Blacks of not being “black enough.” This is not about rejecting white women who are allies in our social justice work. Being an ally does not require one to change his/her essence or likeness and to assume the physical and cultural attributes of the oppressed. I do not aim to minimize the contributions she made to the Black community that she serves, but I am concerned about the damage she's done to black womanhood. Dolezal made a mockery out of black womanhood, reducing the complexity of our lived experiences to an exchangeable commodity that can be worn and displayed for admiration and advancement. 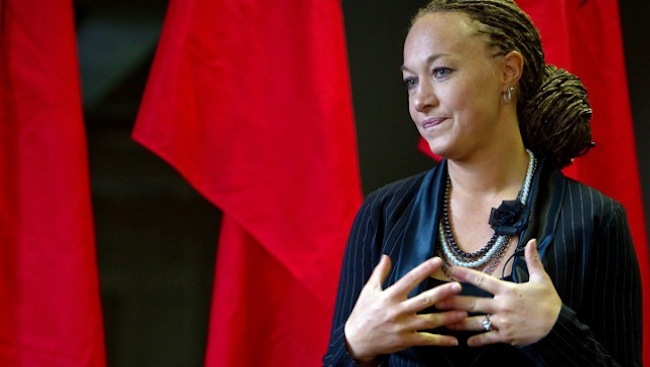 To this end, I analyze Dolezal’s appropriation, privilege, pretense, displacement, and manipulation. Dolezal becomes another person in the long list of non-Black women who unjustly take on attributes of Black women (think Iggy Azalea and Miley Cyrus) without sharing in the systematic violence that characterizes our lived experiences. Even though Dolezal seems to have emulated Black womanhood, she still possessed whiteness and its inherent privileges. Unlike most Black women, she had the ability to appear "White" should she want or need to do so. In Their Eyes Were Watching God, Hurston described the Black woman as the mule of the world. Though being a Black woman in this country certainly has its challenges, I would never want to rid myself of Black womanhood. It carries a legacy of pride, strength, and courage, and Dolezal is wrong for trying to usurp this identity as her own. Though she can darken her skin, coil her hair, and even perform work on behalf of Blacks, she can never own the fullness of Black womanhood.